The ATF is the only laser facility in the world operating with a picosecond-and terawatt-class CO2 laser in the Chirped Pulse Amplification (CPA) regime. 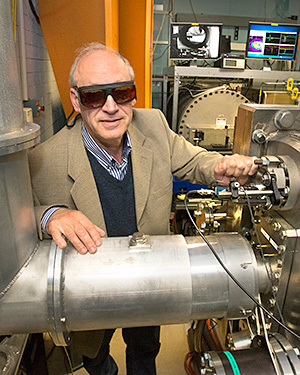 Generation of the mid-IR laser beam starts with a micro-joule, sub-picosecond, 9-11 micron seed pulse in an Optical Parametric Amplifier (OPA) pumped by a Ti:Sapphire laser. Depending upon the selected regime, the seed can be centered on the 9R or 10R CO2 spectral branches. Then, the laser pulse is frequency-chirped and filtered in a grating stretcher to match the gain spectrum of the CO2 amplifiers. 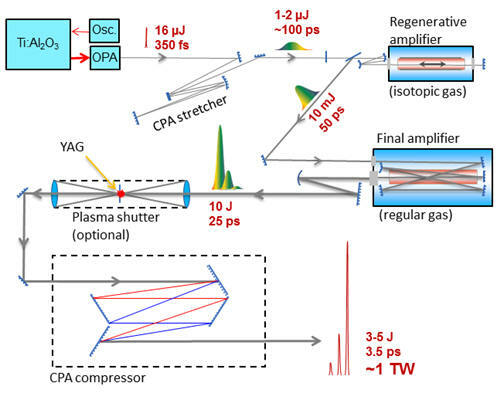 The chirped laser pulse is amplified to ~10 μm energy in a high pressure, regenerative CO2 amplifier isotopically enriched with ~50% of Oxygen-18. The mixture of isotopes provides a smooth spectral gain envelope to avoid pulse splitting due to spectral modulation by CO2 rotational structure. The amplified pulse from the regenerative amplifier then makes multiple passes through a high-pressure final amplifier where the pulse evolution depends on the amplifier's gas content. With non-isotopic CO2 gas filling the final amplifier, the optimum laser wavelength is defined by the strongest 10R band in the amplification spectrum. In this mode of operation, the spectral width of this band defines a 3.5 ps bandwidth-limited pulse duration after amplification. The amplified pulse is partially split at 25-ps intervals as defined by the rotational structure in the CO2 gain spectrum. The output pulse from the final amplifier is compressed using diffraction gratings in the CPA compressor providing peak output power in the ~1TW class. Diagram of the ATF CO2 laser system as it is presently configured (2017). A plasma shutter is available to decouple user experiments from the laser system. The plasma shutter serves to block parasitic refections from the plasma interaction point in a user experiment (such as LWFA or ion acceleration) by absorbing them with a properly timed plasma ignited by a Q-switched YAG laser. The ATF has an ongoing research program to optimize the CO2 laser system to provide higher peak power and shorter output pulses. In the near future, we will institute the use of isotopic CO2 mixtures in the final amplifier. This will optimize the final amplifier spectrum to coincide with that of the regenerative amplifier where the stronger and broader 9R spectral band provides amplification that is virtually free of the fine modulation defined by the rotational structure. This will greatly reduce distortions of the laser pulse in the amplification process and will enable a shorter, ~2-ps, transform-limited pulse width upon compression. This will provide nearly twice the output peak power relative to the system's current performance. A second mid-term R&D thrust at the ATF is development of non-linear pulse compression to provide even shorter laser pulses to our users. 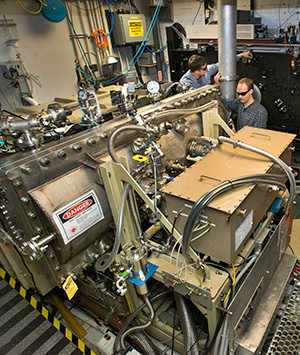 In the longer term, groundwork for a major CO2 laser upgrade to the >10 TW ultra-fast regime is being implemented in BNL Building 912 as part of the ATF-II upgrade.